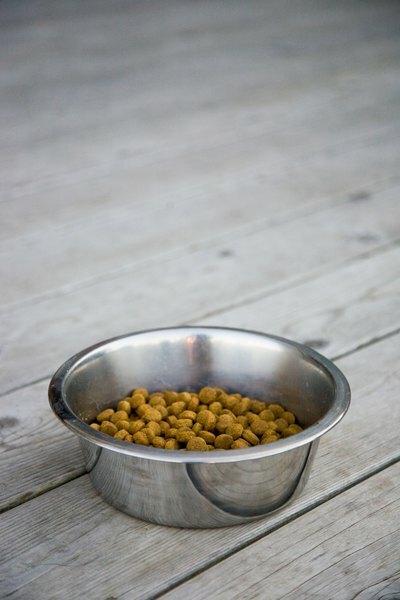 Homemade crunchy dog food is easy and inexpensive to make. Making dog kibble at home is simple -- mix a basic dough with your dog's favorite foods to create a crunchy meal. Keeping harmful additives and preservatives out of his food benefits his health, and making dry food from fresh ingredients can be less expensive than purchasing a commercial brand. Combine the dry ingredients with the wet ingredients and mix into a thick, moist dough, similar to bread. Add any additional ingredients that you wish to mix in, such as the cheese, shredded meat, pureed fruits or vegetables. If the dough is too dry, add some additional liquid; if it is too wet, add some additional flour to get a smooth consistency. Remove the baked "cookie" from the tray and break it into bite-sized pieces for your dog. Store the crunchy dog food in an airtight container in the refrigerator. Herbs and spices may also be added to your dog's kibble, as long as they are not considered toxic to your dog (such as onions or garlic).